Kenny Wheeler finished his career and his life with a near-timid masterpiece. Call me wistful or melodramatic, but I believe the world lost a precious musical voice in late 2014 when jazz trumpeter / flugelhornist Kenny Wheeler died. Wheeler was not exactly a household name, but he was the perfect example of a gentle giant of the genre. His work was thoughtful and understated, all the things that jazz music's detractors probably secretly wished to discover in someone's work. He was looked up to as a performer, composer and educator. And if he never became a household name, he certainly grabbed the attention of many jazz celebrities. Between his work with Bill Frisell, Keith Jarrett, Dave Holland, Anthony Braxton, Bill Bruford, Fred Hersch, Jack DeJohnette, Wadada Leo Smith, Steve Coleman and Azimuth, it's a small wonder that he never received some sort of lifetime achievement award. He made his mark on countless albums, as both leader and collaborator, yet listening to Songs for Quintet gives me the sense that we have been cheated out of more material. Released posthumously, Wheeler's final album shows the 84-year-old legend making music the same way he always had -- with class, mood and spontaneity. And if Wheeler's declining health at the time impacted his playing in any way, Songs for Quintet show it to be a remarkable non-factor. If someone can pull off an album like this while they're dying, then there's hope for us all. For Songs for Quintet, Wheeler assembled a current personal dream team of sorts. It's a good fit for the ECM / Manfred Eicher aesthetic where the natural recording space enhances the musical interplay. Wheeler shares the leads with saxophonist Stan Sulzmann, gives the background coloring job to guitarist John Parricelli. Chris Laurence and Martin France are the rhythm section and together their grabs for attention are as subtle as a jazz rhythm section can get. This quintet reads like a modern jazz combo, but Songs for Quintet plays out like a chamber jazz album. All the instruments don't just mesh together, they melt together. If Kenny Wheeler ever had an off day in the studio, an unfortunate reality in advanced illness, it was easily glossed over by the strength of Wheeler's compositions, his band and their sense of telepathy. Songs for Quintet is built entirely of originals, with two out of the nine from Wheeler's past getting makeover performances. "Old Time" sounds light and carefree with this quintet and "Nonetheless", originally from Angel Song concludes the album. Yet these two songs composed in the '90s stand out amid stuff written and recorded for the 2014 session. Wheeler once self-deprecatingly described his songs as "soppy romantic melodies with a bit of chaos." But for his swan song, the chaos takes a back seat. 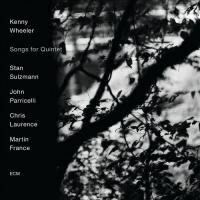 A song's title, like "Jagsaw", might foreshadow complexities, frustration or something far more menial, but Kenny Wheeler's taste for freedom and improvisation sound far less daring than they might be in reality. This isn't a critical demerit, this is some one-hand-clapping stuff. Wheeler and Sulzmann's horns on "Canter No. 1" form a pitch perfect autumnal design and "Sly Eyes"'s military snare march matched with Sulzmann's cabaret airs is an experience unique among jazz albums -- even the great ones. It's bittersweet to hear Parricelli sound off the quiet starting notes for opener "Seventy-Six", a reminder that Kenny Wheeler's contributions to this world have come to an end. The closer "Nonetheless" spends most of its time bobbing along in a faux-samba, but its final 40 seconds are just plain sad. Wheeler sustains a note, Sulzmann riffs over it, and Parricelli rolls around a three-note figure as Laurence and France lead the quintet in a most humble decrescendo. Then, they are out. Good night, rest in peace. You deserve it, Kenny Wheeler.